I envy my dad: He gets letters in the mail. Paul and I get bills, Fabric Depot fliers and seed-germination results. The college kids get credit card offers and updates on financial aid or grades. Dad gets letters. They come from Iowa, Kansas, Minnesota and elsewhere, with stamps canceled in small towns, handwritten addresses on the front and often a few fun stickers on the back. Last week, he got three letters in a single day’s mail. He pulls out his yellow pocketknife and carefully slices open the short end of the envelope, just as he has for probably 90 years. He blows a quick puff at the sliced opening to ­separate the sides, then reaches in and pulls out greeting cards, newspaper clippings, photo­copied articles and, of course, letters: pages of ink and words and love and connection, folded in thirds. I want to, so I do. Johnny irrigated his fourth planting of corn and hopes the cows don’t get into it. Cousin Barbara says the mice are eating her cucumbers in the garden — she didn’t know they did that. My brother Marcus and his wife are headed to Canada to visit their daughter and hopefully find some hungry fish as well. A ­historian cousin sends the shocking news that a long-ago acquaintance’s death may have been murder rather than an accident. In this era of text-­message communication, where even emails are becoming outdated, I have a nostalgic fascination with letters. Colorful stationery waits in one of my desk ­drawers; envelopes and address labels in another. I have just the right fine-tipped black pens, an old recipe tin full of addresses on file cards, and pretty stamps from the post office. I even follow letter-­writing sites on Instagram. Full of shots of elegantly addressed ­envelopes, hand-decorated paper and inspiration, they turn an old-­fashioned art into modern creativity. Sadly, though, I seldom get letters in the mail. Because, to be harshly honest, I seldom actually write them. Hosting my dad forces me to think about the things I say, the decisions I make, and the results I get. 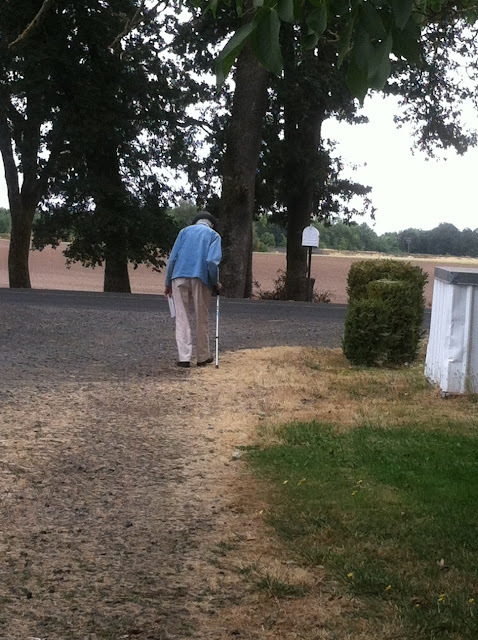 He is 100 years old, and this is his fourth consecutive summer with us in Oregon. Thanks to his deliberate ­personality, his Amish ­theology and the reality of growing up in Oklahoma during the Dust Bowl, Dad has an unusual ­clarity about choices and results, sowing and reaping, and the huge difference between thinking about doing something as opposed to actually doing it. Like most of us, he knows about nutrition and exercise. Unlike many of us, he deliberately eats small, nutritious portions and goes for a walk every day, forcing himself to go outside even though it’s hot, he’s sleepy, and his legs are stiff and unsteady at times. Knowing, by itself, doesn’t keep him healthy and limber; only heaving off the couch and thumping outside with cane in hand, drinking mugs of hot water, and eating piles of lettuce and broccoli does. “Faith without works is dead,” the Bible’s Book of James says. We Amish and ­Mennonites, ­sisters under the Anabaptist theological umbrella, quote it a lot. We are skeptical of talk, opinion, pretension and insistence until we see how a person lives. “Show me, don’t tell me,” the writers’ mantra, could be our denomination’s as well. We live in a strange era in which beliefs and opinions seem to count as much as action, and an emphatic Facebook post about prison reform or preserving our forests qualifies as having done something about it. Our daughter Emily went to Oregon State University every day with a mug and tea bags in her backpack. She knew where all the hot-water ­dispensers were located and often arrived in class with a comforting cup of hot black tea. She didn’t have an ­ideological agenda. It just seemed like the right and responsible thing to do instead of spending money on daily doses of tea in throwaway cups. Emily had one young professor who, she said, didn’t try terribly hard to hide his political preferences. “How does that work, you bringing a mug to class?” he asked Emily one day, bewildered and amused, as she settled into her desk. She explained. He listened kindly but still seemed confused. Then he took a swig of coffee from his daily ­disposable Starbucks cup and went on with the class. For a Mennonite student, it was an eye-opening moment. My dad would be utterly bewildered by my Instagram feed with the pretty ­calligraphy on white envelopes and the ­butterflies cut out and glued on lined paper. He sees the clear line connecting decision and effect, and the worthlessness of opinion without action. You aren’t into letter writing if you don’t write letters, and you won’t get any letters in the mail if you don’t send them. I’m sure that would be his ­philosophy, should he choose to put it into words. Dad doesn’t talk about ­writing letters. He writes letters. When he comes in from his walk, he sits on the loveseat, places a lap desk on his thin legs, and taps a piece of lined notebook paper into the correct angle. He clicks his ballpoint pen, an invention that is still a marvel to him. Slowly, with perfect penman­ship, he fills the page with ink and words, weather and news and stories, harvest and apples and family history. Soon, he and his cane thump to the mailbox. He sets the envelope in the little groove, closes the flap and raises the little flag. That afternoon the letter is on its way, full of paper, ­promise and connection. He comes inside, knowing that Truman, Johnny and all the others will, most likely, soon write back. I know better than to ponti­ficate to Dad about my interests and passions — Jesus, justice, responsibility, orphans, stewardship, creativity and many more. For one thing, Dad has a hard time hearing me. Much more importantly, he is sharply observing my life. He knows what I really believe, because he sees what I do. Emphatic opinions are like the dandelion fluff blowing in the hot wind and ignored as he heads to the mailbox, letter in hand. It’s the doing that tells the truth about what you believe. Do I really want to get ­letters in the mail, and am I truly interested in renewing the art and skill of letter-writing? If so, I will, before long, be ­following Dad’s footsteps to the mailbox in the early afternoons, envelope in hand, sending ink and paper on its way, sure of a soon reply.